Tuesday 17th Sept dawned clear and bright. Turned out at 7am & had breakfast, after which we played for a Battn parade & then went for a short route march. 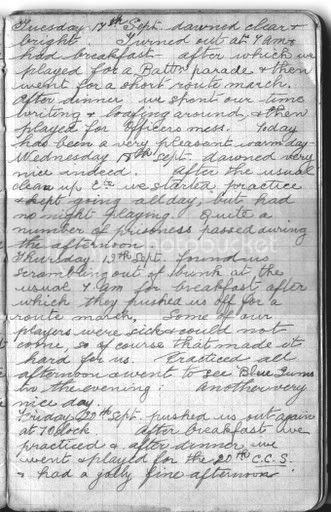 After dinner we spent our time writing & loafing around, & then payed for the officers mess. Today has been a very pleasant warm day. Sunday 17th Sept. Rain during the night, some showers early then cleared up. Almost finished the latest woodworking project - just the varnishing to be done now.